Achalasia is a rare esophageal motility disorder that is usually treated with endoscopic interventions and/or surgical myotomy. The goal during surgical myotomy is to relieve the esophageal outflow obstruction by dividing all muscle fibers from 2-3 cm distal to the gastroesophageal junction and onto the esophagus 4-6 cm proximally. An incomplete myotomy can lead to recurrent or persistent dysphagia, so meticulous division of all muscle fibers is imperative. Occasionally, the quest to divide every last muscle fiber results in mucosal perforation. Mucosal perforation extends the length of the case, leads to additional post-op testing (upper GI), and may prolong the hospital duration of stay. The use of robotic technology for Heller myotomy may facilitate the operation compared to a standard laparoscopic technique due to better visualization and dexterity with the robot. 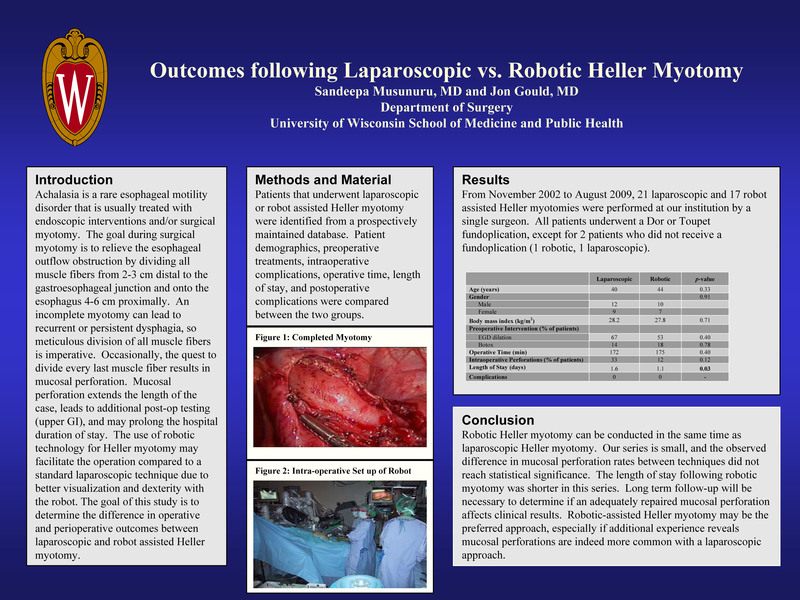 The goal of this study is to determine the difference in operative and perioperative outcomes between laparoscopic and robot assisted Heller myotomy. Patients that underwent laparoscopic or robot assisted Heller myotomy were identified from a prospectively maintained database. Patient demographics, preoperative treatments, intraoperative complications, operative time, length of stay, and postoperative complications were compared between the two groups. From November 2002 to August 2009, 21 laparoscopic and 17 robot assisted Heller myotomies were performed at our institution by a single surgeon. All patients underwent a Dor or Toupet fundoplication, except for 2 patients who did not receive a fundoplication (1 robotic, 1 laparoscopic). Robotic Heller myotomy can be conducted in the same time as laparoscopic Heller myotomy. Our series is small, and the observed difference in mucosal perforation rates between techniques did not reach statistical significance. The length of stay following robotic myotomy was shorter in this series. Long term follow-up will be necessary to determine if an adequately repaired mucosal perforation affects clinical results. Robotic-assisted Heller myotomy may be the preferred approach, especially if additional experience reveals mucosal perforations are indeed more common with a laparoscopic approach.